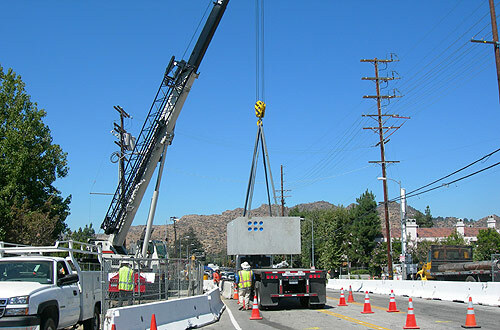 Construction crews install DWP utility vault on Lassen Street as part of Metro Orange Line Extension construction project. It’s been a while (June 2009 in fact) since Metro broke ground on the Metro Orange Line Extension, the first official major project to leave the starting gate following voter-approval of Measure R in 2008. It’s now time to provide a progress report on construction, and from all indications, construction is moving full speed ahead. Construction crews have been clearing the four-mile right-of-way between Canoga Park and Chatsworth so that they can start building the actual busway in the spring of next year. Work is also beginning on a bridge over Lassen Street that will physically separate the busway from Metrolink, Amtrak and Union Pacific trains and Lassen Street. Metro plans to open the Orange Line extension in summer 2012. Public attending the Thursday, September 2 community briefing in Canoga Park will be able to see the progress to date and renderings of what the extension will ostensibly look like when finished. The meeting will be held from 6 p.m. to 8 p.m. at the LAPD Topanga Community Police Station’s Community Room at 21501 Schoenborn Street, Canoga Park, CA 91304. A map of the meeting location is after the jump. Click here to see full news release.